Whether you are looking to add a personal touch to your Kia style or you would like to protect your quality Kia paint from rock chips around Lacey, WA, a genuine Kia hood protector is ideal. Because it is a genuine Kia accessory, you can rest assured that it is made with the highest quality for the perfect fit. Come see one of the parts professionals in our Parts Department for the Kia hood protector specifically made to fit your model and continue your journey with the style and protection it provides. We always have these quality hood protectors in stock and we are happy to order anything we may not have. 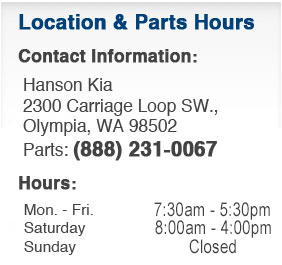 Come see us and find out how else we can help you get more from your ride at Hanson Kia near Tumwater, WA.